The automotive industry is advancing quickly. 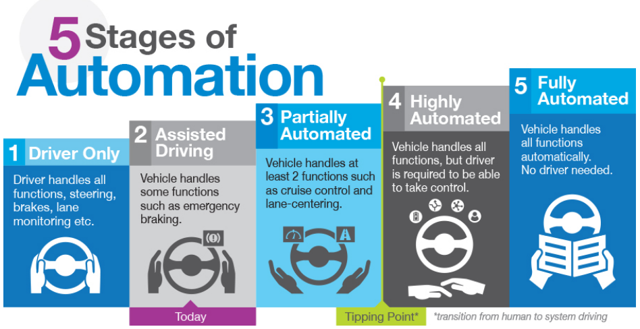 Most of the advances are for new technology being incorporated into vehicles as we move up the autonomous vehicle ladder of levels. The likely long-term beneficiaries of the advancing automotive industry are discussed. I recently wrote a broad overview of the automotive industry and the various trends that are developing in an article titled, Automotive Industry Current and Long-Term Future Outlook. In that article, I explained how vehicles are moving through the stages to eventually get to be fully autonomous. In this article, I'm taking a deeper dive into the technology companies that are producing the 'brains' of advanced vehicles over the next decade. Out of the five levels of autonomous vehicles (with level 5 being fully autonomous), we now have level two vehicles legally sold and driving on the road today. Level two vehicles have two or more advanced driver assist systems [ADAS] that can be coordinated simultaneously. These features include: active lane keep assist, adaptive cruise control, and automatic emergency braking. Nvidia (NVDA) has technology to take Level 2 up to Level 2+ and beyond. 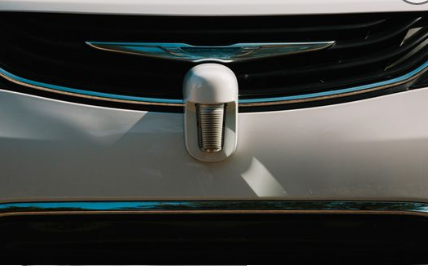 Level 2 vehicles have forward facing sensors to detect hazards. Level 2+ kicks this up a notch by adding 360 degree surround perception and artificial intelligence [AI] into the systems. Level 2+ also includes driver monitoring, voice and gesture recognition, and advanced in-cabin visualization of the vehicle's perception. Nvidia's DRIVE technology is a scalable AI platform for autonomous driving beginning with Level 2+. The company's DRIVE AutoPilot provides a driver assistance experience that solves issues inside and outside the vehicle. DRIVE can perform 30 trillion operations per second, using only 30 watts of energy. Part of the DRIVE technology is Nvidia's Xavier system on a chip [SoC], which makes the Level 2+ features possible. The Xavier system was considered the world's first autonomous machine processor. This took over 2,000 engineers and over 4 years to develop. This research found that higher computation performance enables higher overall safety. Safety is an important factor when you're talking about self-driving vehicles. TUV SUD, one of the world's leading technical service providers of testing, auditing, inspection, and system certification, declared Nvidia's Xavier system as suitable to build safe vehicles. The Xavier system passed the first 2 assessments for ISO 26262 compliance (global standard for functional safety). The system now needs to pass the final step to ensure the final product achieves its intended safety performance. The final step is expected to be completed soon. 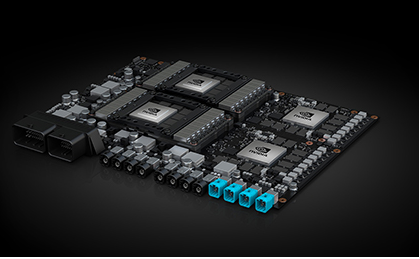 Nvidia's DRIVE system for Level 2+ technology is expected to be in production by 2020. Since the system is scalable, we can expect Nvidia to produce the technology for Levels 3 through 5 further out in the future. So, Nvidia has a good chance of being a solid long-term investment for the automotive industry as the company benefits from a new source of revenue. Currently, Nvidia derives most of their revenue from gaming and data center technology. Through the acquisition of Mobileye, Intel (INTC) is poised to be a major player in the future of automobiles. The company developed a mathematical model to ensure that autonomous vehicles operate safely. This solution is known as the Responsibility-Sensitive Safety [RSS] model. The RSS technology provides measurable parameters to help prevent the AV from being the cause of an accident regardless of the actions of other vehicles. For example, the technology ensures that safe distances or gaps between vehicles exist before merging into another traffic lane. The factors that are placed into the programming include: what are dangerous situations, what caused it, and how to respond to it. Intel is another company to keep an eye on as technology continues to advance into the higher levels, getting us closer to fully autonomous driving. Intel is also set to benefit from memory and 5G technology over the next decade. Micron (MU) is poised to be another major player for providing the technology for autonomous vehicles. Micron has been recognized as an industry leader for their memory and graphics technologies: GDDR5 and GDDR6. It is the GDDR6 technology that provides the bandwidth to enable the AI for autonomous vehicles to operate safety in accordance with industry standards regulated by NHSTA. GDDR6 is the highest performance memory technology available on the market today. It has the ability to operate under the harsh conditions (temperature extremes) that vehicles endure. Expect Micron to be a major player to provide the advanced memory needed for the complex computing needed for autonomous driving. The demand for GDDR RAM will come from more than just the automotive industry. Additional applications include: 4k and 8k video processing, AR and VR hardware, data center/networking, and AI and ML technologies. Micron produces GDDR6 for Nvidia which is incorporated into their GeForce RTX-20 series graphics cards. Competitors that also make GDDR6 include: Samsung (OTC:SSNLF) and SK Hynix (OTC:HXSCF). With just a few players in this space, Micron is likely to benefit over the next decade as long as the supply/demand situation for GDDR6 remains favorable for pricing strength. Microsoft (MSFT) is positioning themselves to be a leader in vehicle infotainment systems, productivity software while traveling, and how autonomous vehicles interact with passengers and connect with the larger operational network. Microsoft is accomplishing this by partnering with automakers to incorporate their software into advanced vehicles. Microsoft is leveraging their strengths in current products such as Azure Cloud, Windows, and Office365 for the autonomous vehicle market. Microsoft is also involved in providing simulation software known as AirSim. AirSim is used to perform real-time virtual tests of self-driving simulations. The advantage of AirSim is that thousands of simulations can be run in a virtual environment based on data collected from real-world driving situations. AirSim can make help make testing autonomous vehicles less expensive through a more efficient method of testing algorithms. Alphabet's (NASDAQ:GOOG) (NASDAQ:GOOGL) AV company, Waymo, recently announced that they plan to sell their lidar sensors to customers who don't compete with their ride sharing services. Waymo's lidar sensor is known as the Laser Bear Honeycomb. This technology uses lasers to build detailed 3D maps of nearby objects. In addition to AVs, this technology can be used in other applications such as warehouse robots, security systems, and autonomous tractors. The decision to sell these lidar sensors is to scale up in order to drive down costs for their AV vehicles. The market for lidar is doubling annually and is expected to by $1 billion in 2019. So, this could be another source of growing revenue for Alphabet's Waymo. The AV market is estimated to create $1.5 trillion in new revenue by 2030. That is the same amount as the student loan industry. So, there is plenty of room for multiple companies to benefit from this advancing wave of technology. All of the companies mentioned in this article are investable stocks right now. I'm not saying they are all screaming buys at perfect purchasing levels. However, these are all companies that operate with positive free cash flow, which creates value for shareholders. These companies are likely to benefit from multiple years of strong growth as technology advances from getting from Level 2 to Level 5 autonomous vehicles approved and commercially sold over the next decade and beyond. As a result, they should be placed on watch lists for optimal buying opportunities. These companies are already successful in other areas, so we can have some confidence that they transfer that success into the AV market. I contribute to Kirk Spano's Margin of Safety Investing where we offer a more in-depth analysis of individual companies. Disclosure: I am/we are long ARKW. Business relationship disclosure: The article was written by David Zanoni with feedback from Kirk Spano. Additional disclosure: David is long ARKW which currently has NVDA as the top holding. The article is for informational purposes only (not a solicitation to buy or sell stocks). David is not a registered investment adviser. Kirk Spano is an RIA. Investors should do their own research or consult a financial adviser to determine what investments are appropriate for their individual situation. This article expresses my opinions and I cannot guarantee that the information/results will be accurate. Investing in stocks involves risk and could result in losses.